Peter Yared's Musings: A New Year's Resolution for Google: Buy MySpace, Stat! A New Year's Resolution for Google: Buy MySpace, Stat! For all the money Google has thrown at MySpace over the years, the search giant of Mountain View might as well have bought the troubled social network. For years, News Corp. CEO liked to brag that Google paid him more in its landmark $900 million search deal than he paid to buy MySpace in the first place. Oh, sure, no one’s bragging now. News Corp. executives are openly talking about dumping MySpace, and Google only recently renewed its advertising agreement with MySpace, after months of delay, in a deal that smacked of throwing good money after bad. But that’s a sunk cost, as economists like to say, and chump change for Google’s multibillion-dollar money machine. What Google really needs is a convincing social strategy to get Wall Street and Silicon Valley’s collected punditocracy off its back. MySpace is for sale. And Google should jump at the chance to buy it. The stratospheric success of Facebook in 2010 has put Google on edge. Five hundred million-plus users, $2 billion in advertising revenue forecast for next year, the gaming and e-commerce platform of the future, and one out of five pageviews. Can you blame Google for flailing at finding a strategy to compete with Mark Zuckerberg’s social juggernaut? The reality is that Google will have as much success replicating Facebook as Microsoft has had replicating Google with Bing. Google’s engineers keep thinking it can use standards to win against a proprietary platform, a strategy that Sun Microsystems — remember them? — employed against then-nemesis Microsoft when Googel CEO Eric Schmidt worked there. Ranging from OpenSocial, a widget platform, to XAuth, a content-sharing protocol, all of these “standards” have failed to stop Facebook and its magnetic attraction for users, developers, and advertisers. The dealmakers of Mountain View, meanwhile, have acquired a grab-bag of companies like Slide and Jambool with the hopes that their key talent somehow understands social Web apps better than Google’s famously cosseted and out-of-touch nerdocracy. The apparent fruit of these efforts — a toolbar-like add-on to existing Google sites called either Emerald City or +1 — does not seem like a viable strategy either. There is no there there: a social network requires somewhere to be social. The right strategy for competing with Facebook is not to take Facebook head-on. Facebook is great for sharing links, photos, and events with people you do know. With recent upgrades to photos and groups, it’s getting even better at that. But there is still a huge opportunity for communicating with people you don’t know, something Facebook is weak at by design. It doesn’t take much observation to see that people love to gather together around common interests, particularly around media properties like bands, TV shows, and movies. It can’t hurt that those also happen to be major advertising categories. During former Facebook COO Owen Van Natta’s painfully brief stint at MySpace, he actually put a viable strategy in place. His experience at Project Playlist, a music-sharing startup, showed that users were very interested in sharing their tastes with friends and strangers. At MySpace he soon put in place a playlist system using MySpace’s legal music content. Acquiring iLike’s recommendation system promised to accelerate that, and a redesign would make it all look great. However, the corporate overlords at Fox were only interested in maximizing revenue rather than adjusting and growing the business, and Van Natta was out. Only after further revenue declines did his concept of “social entertainment” actually ship. At the time MySpace still had more revenue than Facebook; it still has roughly as many unique users as Twitter — a persistent object of Google’s acquisition interest, despite its unproven revenue strategy. So what would Google do with MySpace? It already has some fantastic properties that it can tie into the site. Vevo, the music site spawned from YouTube, is fast becoming the premier destination for music videos on the Web, the MTV of the social generation. That and the rest of YouTube ties in perfectly with MySpace’s music core. Like MySpace Music, it’s also a joint venture with the music labels. YouTube videos, already ubiquitous in MySpace user profiles, could spread throughout the network. Though Google’s Orkut social network, a Friendster clone, is fading, it still has pockets of strength like Brazil. Those users can be migrated into MySpace to create an international beachhead. Google News can feed into the MySpace homepage. 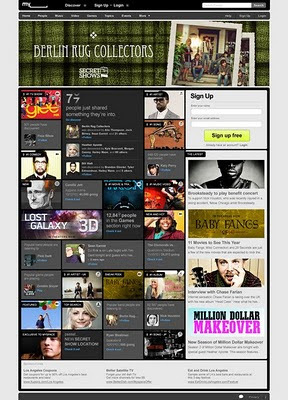 MySpace has a reputation for bad design, but its new design is remarkably good. Those cats in Hollywood actually know how to do mass-market fun, something Googlers just can’t grok, and even Facebook can't match with its boring, tightly controlled brand Pages. Sure, there’s a downside — the institutional pain of integrating disparate cultures and creaky technology. But both Google and MySpace need a radical shakeup to succeed in social, and an acquisition could be the galvanizing event that forces change on ossified organizations. And fear is a powerful motivator. Google and MySpace can grow irrelevant separately, or challenge Facebook together. Eric, Rupert, there’s never a bad time to make new friends.